The motor of fiction is storytelling. We readers perch on the precipice of plot. Generate a text from disparate authors who mine the sonic landscape and you are invited into a more lyric space of metaphysical meaningfulness—an ‘aboutness’ rather than a ‘what next.’ Peak behind the curtain: that’s where all the wires and pulleys and machine’s guts reside. And maybe there is no linear plot, but instead a magic ensues if we were to hear the gears and hammers loudly looping and clanging and creaking and sparking. Listen, also, to those motley elements for their sonorous alignment and dis-ease. London sound artist Seth Guy has built a narrative engine out of the fiction he has read these last five years. He gestures towards the reader’s ears. What is born is The LiteraryMix. Not narrative, rather its möbius text is composed of hundreds of excerpts of fiction which are linked thematically by the sounds they describe. Like any digital text, it’s more jelly fish than vertebral; an invertebrate eludes our grasp. Seth Guy takes a lead from DJ Spooky. The parallels to music are key in the legacy of chance-oriented writers. It’s a similar sampling that allows Guy to appropriate, re-configure and juxtapose material to create playful works for his own sonic compositions. Not surprising, then, is his focus on listening to what he reads, to get a whiff of its sounds. 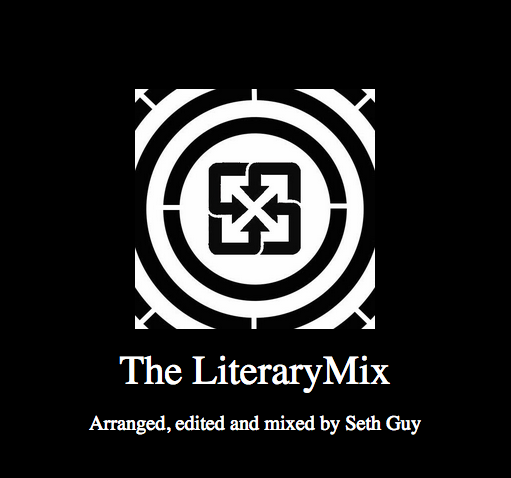 The LiteraryMix is an entwining—an aroma—of sonic memory and imagination. To ‘read’ this mix is to open to the possibility of being lost. Its size and very duration is ambiguous as it lives entirely online. There is a bibliography to confirm the book and author whose excerpt is generative of the bigger story of listening to the inner workings of this new ‘story.’ Apparently, it’s hidden at the center, like any well-constructed labyrinth. Guy suggests this continual flux locates readers to both the sonorous events the text describes and to their times and locations. To immerse within the The LiteraryMix is to find yourself in a ‘nowhere’ beyond fiction. In a culture that feels like it’s crumbling under a thickening pall of smoke, to write a text is to propose a reading of the world and to reveal its potencies. Writing is reading and reading is a way back to the initial impulse. Both are acts of revelation. Early calligraphers delighted in creating mazes. What do you find at its center? along a spur? The LiteraryMix is labyrinthine. To ‘read’ across these mazes is to hear and to listen. To listen to silence on and off the page might offer a respite of literary joy from the world’s noise-full horrors. To consider noise and silence, to hear the sounds inside a character’s head and then be led towards its music is revelatory of the inner calm that comes of reading fiction. Viewing is passive; reading is always an act, a collaboration. A book is not showy in its technology, but complex, extremely efficient. A captivating little device. What happens when you dismantle it, tear its pages, elusively or literally? To read as such is to participate in one’s own textual expeditions. Do you want to trail off and … listen to the music or the possible phone call from the other end? listen to the ensuing silence? listen in the street? to the rain in the street? in your hotel? in a city in the west? in another room? These are some of the choices Guy offers; they feel infinite, like a long, lazy morning in bed. This kind of listening-reading alters your temporal space, your sense of plot, your very sense of yourself as the excerpt you’ve chosen slowly fades up into its letters, words, sentences—and sounds! It’s a very quiet space, full of aurality. Writers seem content to float around these sonorous elements in their world-space of text. Why do readers hear so well there? In his accompanying essay to The LiteraryMix, Guy concedes that authors aim to confer what they mean rather than a direct transference of experience. Then he asks: is it not the reader’s imagination and memory, not the writer’s, which work to liberate what one reads, and when bound to the analogy of a mix, allows the reader to consider texts from an entirely different perspective? Loose guidelines enact a performance generated by the reader. Sonorous details, whether eclipsed in fiction or poetry or lyric essay or creative hybrids, adhere more readily to my memory of a text. Maybe some readers like to float and stumble more than sticking fast to a plot. The LiteraryMix is beckoning. 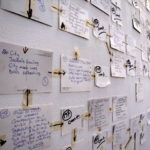 The discovery of The LiteraryMix and Seth Guy’s attentiveness to questionable sounds and authorship sparked a curiosity for me as Earlid’s curator, but also a memory of Plausible Narration, a project from my own sound-art archives. I devised this ‘book’ of sound pages in the late 1990s, when shuffle-mode on the play-back machine was the primary driver in a mostly-empty gallery offering sounds off the page and into the ears. A story begins, is interrupted. Voices proceed and then double-back on themselves. Sounds swirl out of gauze-wrapped audio speakers situated atop two pedestals. This yielding of authorial control as well as the viewer’s position as neo-listener (a ‘not-viewer’ of any particular object) is integral to the work. By disembodying the text, some of it avidly appropriated, like Seth Guy’s construction, into an aural medium, I offer ‘a’ story that undermines both the book and the hypertext. There is no control for either the listener or the artist as to the text’s unfolding, no links to choose an autonomous path of reading. Plausible Narration is meta-hypertextual. I might have called it a difference engine back then. Akin to The LiteraryMix, the provocation is off-map. Another intersection bisects both The LiteraryMix and Plausible Narration, and we beckon towards the work and ideas of Caroline Bergvall. 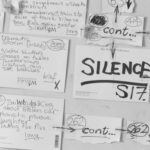 A writer and vocal performer of multiple textual layers, she works across artforms, media, languages and locations (Bergvall resides in both the UK and in Geneva). She plies these mediums and geographies to potentially rescue narrative. Textual mass is flattened in a 3-D environment—you see the words and they meld like sound. Similar to The LiteraryMix and to Plausible Narration, sound-making becomes something altered in Bergvall’s hands. Her efforts to identify her artistic practice—to corral it towards its many meanings—invites a contrast towards both these works. Bergvall and I had an ongoing conversation about her artistic practice, which originally took place in 2014 for Trickhouse. Follow the ‘plot-lines’ across these many pages, wires and waters. 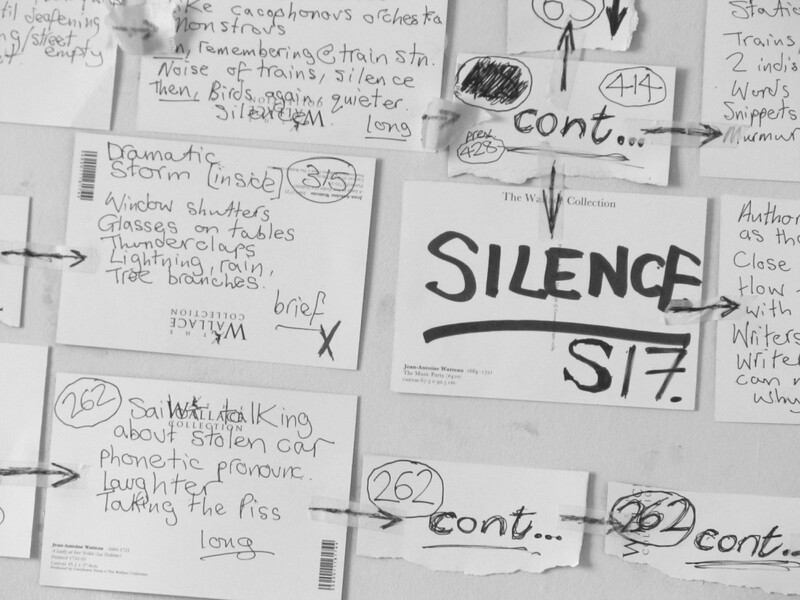 We intersect sounds and ephemera, blown papery whispers and the potential of drying ink. Begin at a beginning.